Yummy Vegan Ramblings: Excuses, excuses. Oh you wonderfully faithful few, my loyal blog readers, I can only apologise for leaving you so empty handed on these cold winter nights. Perhaps this might cheer you up? It's a list of all the vegan own brand products that Sainsbury's stock, neatly ordered under their departments. Don't use Sainsbury's? The other main supermarkets have lists too, have a google. Not the most appetizing. Wouldn't it be nice to have a hearty curry or pie in the freezer? - at least by making our own we know exactly whats inside, healthy or otherwise. Despite the poor choice of frozen meals there's a surprising amount of fresh meals, all the obvious Indian snacky bits, mediterranian pasta, all sorts of pots of beans and some couscous which I've had before, good for a snack on the go, shared with a lovely vegan companion of course! 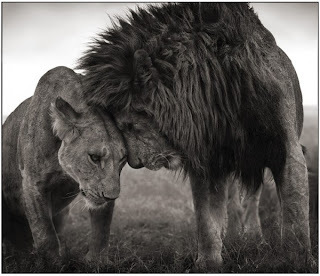 Who knew a photo of lions could hold such emotion?